The transfer of the aircraft carrier Vikramaditya, formerly known as Admiral Gorshkov, to India has been planned for several years already. Although the warship, under refurbishment since 2004, was to join the Indian navy in 2008, the carrier's update is behind schedule. A heavy increase in the cost of both labor and components plus the Sevmash facility's lack of experience in dealing with large surface ships have all contributed to the delay. In spring 2007, the announcement that the transfer of the Admiral Gorshkov to India would not take place before 2010 was followed by protracted talks on the price and term of the contract. Verbal agreement on major issues was announced several times, though no final agreement has yet been achieved. On November 13, Sevmash's announcement that the updated carrier would soon be afloat was followed by a notice that the warship could join the Russian navy if no agreement on costs is reached. Sevmash deputy CEO Sergei Novoselov said at least $2 billion are needed to complete the work on the ship. Meanwhile India reported that it is prepared to allocate no more than a few hundred million dollars for the project. It is unclear when and how will this argument end. Most likely it will happen before the end of this year. What will it mean for Russia if the ship doesn't end up in India? On the one hand, a failure to meet commitments to a foreign partner would hit Russia's reputation. On the other hand, a possible decision to provide funding to complete the ship and return it to the Russian navy would favor both the country's defense industry and the navy, which needs an aircraft carrier. The current state of the Russian armed forces requires an immediate increase in hardware even through reducing military exports, as was the case with the Iskander tactical missile system. The Iskander is not to be sold abroad until the country's army receives the required number of these launchers. Regarding the Admiral Gorshkov, what will this ship be like once completed? It will have a 38,000, 48,000 and 53,000 ton unloaded, standard and laden tonnage, respectively, and a 273-meter long flight deck. The vessel will carry 16 to 20 MiG-29 fighters and six to eight Kamov Ka-28/Ka-31 helicopters. If sold to India, the ship will also be able to carry HAL Tejas trainer aircraft and Dhruv light helicopters. Besides aviation, the warship will be fitted with Kinzhal air defense missiles and Kashtan air defense gun/missile systems. The updated ship will be closest in performance to the French nuclear-powered aircraft carrier Charles De Gaulle, which has a slightly lower laden tonnage of 43,000 tons and a higher endurance thanks to its power plant. The more rational design of the latter also provides more room on the hangar deck, 4,600 sq m compared to 2,900 on the Admiral Gorshkov, enough to contain up to 40 aircraft. The Russian ship, however, will be faster and, according to some experts, will have higher sea worthiness, ensuring aircraft operation in adverse weather. 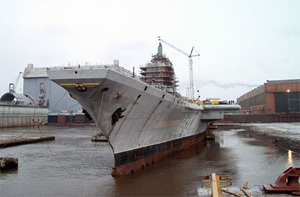 A significant advantage of the Admiral Gorshkov returning into service with the Russian navy would be that it could take to the sea as soon as early next decade, while an advanced aircraft carrier, if put into production in December 2008, would not be completed until 2014 or 2015 at best. The destiny of the aircraft carrier will be clear soon. It's hard to tell, though, which of the two possible outcomes will be best for Russia.